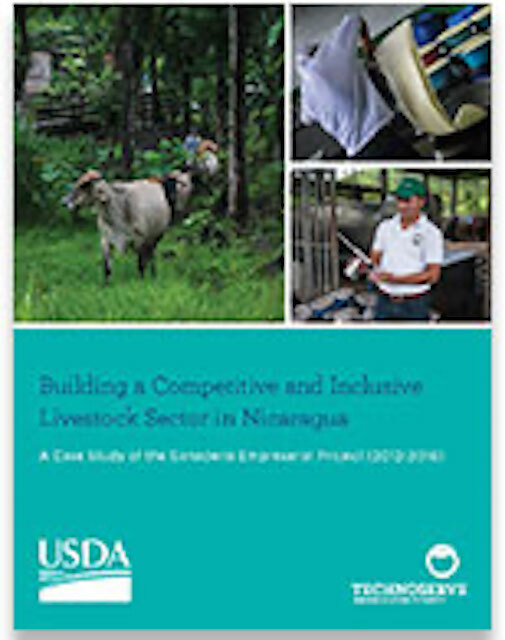 Read our case study: "Building a Competitive and Inclusive Livestock Sector in Nicaragua." The livestock industry is a major contributor to Nicaragua’s economy and holds great potential to alleviate poverty in the country. Nicaragua is the largest producer and exporter of livestock products in Central America. The industry accounts for more than 10 percent of all jobs in Nicaragua and 50 percent of the value of agricultural production. But productivity was limited by major barriers, including animal nutrition, government policies and animal health services. Of the more than 100,000 livestock producers in Nicaragua, 80 percent are smallholders owning less than 20 cows and earning net incomes of less than $3 per day. In order to increase revenues and earn a sustainable livelihood from livestock production, smallholder producers need to be equipped with more productive agricultural practices and an improved enabling environment. Ganadería Empresarial (GANE) was a four-year livestock initiative that aimed to improve the incomes of 4,000 rural smallholder producers in Nicaragua. TechnoServe helped farmers increase livestock productivity by providing training in farm management, recordkeeping and animal husbandry. The initiative addressed the sector's key barriers and constraints, positioning Nicaragua's livestock industry to compete on a global scale. GANE sought to expand trade in livestock products by linking producers to higher value markets and helping producer organizations and small processors fulfill market commitments. TechnoServe also improved the industry’s ability to meet stricter international foods safety standards by implementing a traceability system and developing the government’s capacity to provide other key animal health services. Supported by the U.S. Department of Agriculture's Food for Progress program, the initiative impacted families in the departments of Jinotega, Matagalpa, North Atlantic Autonomous Region and South Atlantic Autonomous Region. From September 2012 to September 2016, TechnoServe implemented GANE in four regions of Nicaragua. 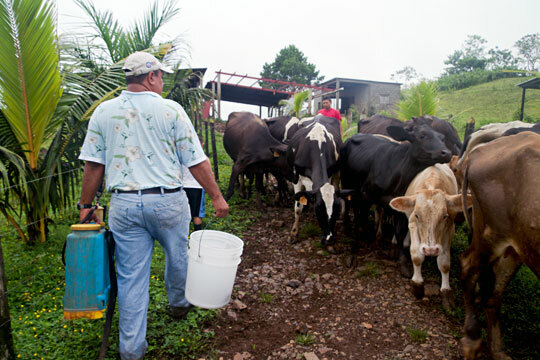 The program trained more than 5,500 smallholder livestock farmers (4.1 percent of the total in Nicaragua), who increased their milk production by an average of 28 percent. Working with these farmers and 25 dairy producer organizations (which included both cooperatives and private businesses), GANE generated incremental sales (directly attributable to the project) of raw milk, live animals, and processed dairy products worth more than $27.4 million. The U.S. Department of Agriculture (USDA) is responsible for developing and executing U.S. federal government policy on farming, agriculture, forestry and food. It aims to meet the needs of farmers and ranchers, promote agricultural trade and production, work to assure food safety, protect natural resources, foster rural communities, and end hunger in the United States and abroad. In Nicaragua, the USDA has donated approximately $40 million over the past ten years to implement agricultural development projects.